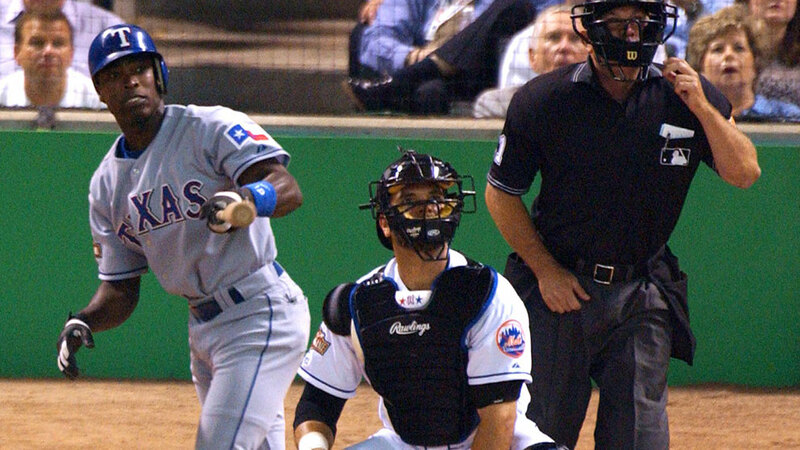 The American League stormed out of the gates in the 2004 All-Star Game, scoring six first-inning runs and never looking back. 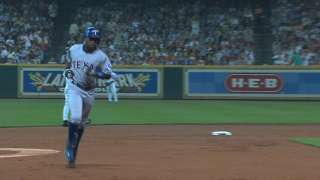 The AL plated all six runs against NL starter Roger Clemens, led by home runs from Manny Ramirez and the game's MVP, Alfonso Soriano. 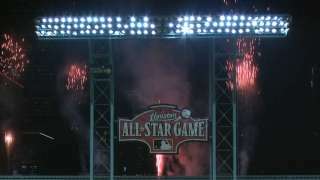 The 9-4 victory extended the AL's unbeaten streak to eight straight All-Star Games. a-Struck out for Mulder in the 3rd. b-Walked for Ramirez, M in the 4th. c-Struck out for Giambi in the 4th. d-Grounded into a forceout for Sabathia in the 5th. e-Grounded out for Rodriguez, A in the 6th. f-Struck out for Crawford, C in the 9th. 2B: Suzuki, I (1, Clemens). 3B: Rodriguez, I (1, Clemens), Rodriguez, A (1, Zambrano). 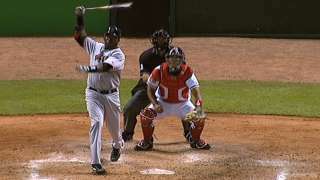 HR: Ramirez, M (1, 1st inning off Clemens, 1 on, 1 out), Soriano, A (1, 1st inning off Clemens, 2 on, 2 out), Ortiz, D (1, 6th inning off Pavano, 1 on, 1 out). TB: Guerrero; Suzuki, I 2; Rodriguez, I 4; Ortiz, D 4; Ramirez, M 4; Jeter 3; Giambi; Lawton; Rodriguez, A 3; Soriano, A 5. RBI: Rodriguez, I (1), Ramirez, M 2 (2), Soriano, A 3 (3), Rodriguez, A (1), Ortiz, D 2 (2). 2-out RBI: Soriano, A 3; Rodriguez, A. Runners left in scoring position, 2 out: Suzuki, I 2; Crawford, C.
a-Grounded out for Kolb in the 2nd. b-Singled for Zambrano in the 4th. c-Struck out for Rolen in the 5th. d-Singled for Kent in the 6th. e-Struck out for Glavine in the 7th. f-Popped out for Beltran in the 9th. 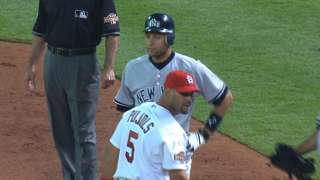 2B: Pujols 2 (2, Mulder, Sabathia), Renteria (1, Sabathia). TB: Loretta; Kent; Sosa; Beltran; Pujols 4; Rolen; Alou; Renteria 2. RBI: Sosa (1), Renteria (1), Pujols 2 (2). 2-out RBI: Sosa; Renteria; Pujols 2. Runners left in scoring position, 2 out: Piazza; Sosa; Bonds; Thome. Game Scores: Mulder 49, Clemens 27. Pitches-strikes: Mulder 28-18, Loaiza 21-13, Sabathia 21-13, Vazquez 10-8, Lilly 15-11, Nathan 19-13, Gordon, T 2-2, Rodriguez, F 5-3, Rivera 11-8, Clemens 35-23, Kolb 14-7, Johnson, R 25-16, Zambrano 22-13, Pavano 33-25, Glavine 12-6, Sheets 13-10, Gagne 19-10. Groundouts-flyouts: Mulder 3-1, Loaiza 3-0, Sabathia 0-2, Vazquez 1-0, Lilly 0-0, Nathan 0-1, Gordon, T 1-0, Rodriguez, F 1-0, Rivera 0-0, Clemens 2-0, Kolb 2-1, Johnson, R 2-0, Zambrano 1-0, Pavano 4-1, Glavine 2-0, Sheets 2-0, Gagne 0-0. Batters faced: Mulder 9, Loaiza 5, Sabathia 7, Vazquez 3, Lilly 5, Nathan 3, Gordon, T 1, Rodriguez, F 2, Rivera 3, Clemens 9, Kolb 4, Johnson, R 6, Zambrano 5, Pavano 9, Glavine 3, Sheets 3, Gagne 4. Umpires: HP: Ed Montague. 1B: John Hirschbeck. 2B: Doug Eddings. 3B: Jim Reynolds. LF: Marvin Hudson. RF: Sam Holbrook.